(b. 1971) – considered one of the most outstanding German-language writers of his generation. 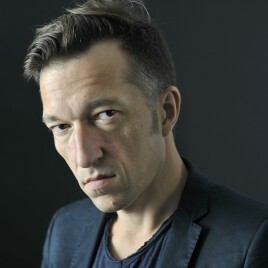 In 2006 his two plays: Seksualne neurozy naszych rodziców and Autobus (Księgarnia Akademicka) were published in Polish. In his work Bärfuss shows the complexity and ambiguity of human relations. He reveals brutal mechanisms ruling power and politics, against which an individual always fights a loosing battle. Bärfuss’ prose opposes to fixed ethical conventions and divisions. In 2010 his acclaimed debut novel Sto dni was published in Poland (Ha!art). In this book Bärfuss shows a post-colonial hell of the civil war in Rwanda. On the one hand the author defies hypocrisy of the western public opinion, which tries to marginalise the conflict, reducing it to a tribal war, whilst on the other hand he ridicules and invalidates the idealist perspective of the lead character, filled with neo-colonialist egoism and naivety. Bärfuss reveals bare truth about contemporary genocide for which no one is entirely blameless. In 2017 his new novel, Koala, was published in Polish.